Any time a student refers to a teacher as a pedagogue he or she is not suggesting that the teacher has feet which are a foot-and-a-half (sesquipedalian) long. The Greek ped used in English is a shortened form of the Greek pais (paid-), which means a "child"; usually a "boy", because in old Grecian times, boys were considered "more important" than girls. Actually, pedagogue means "a child's guide" or "guiding a child". In ancient Athens, the pedagogue was a slave who led his master's children (boys) to school or provided private tutoring. In the U.S., the equivalent of "guiding a child" is now "home schooling". In time, the word became known as a "teacher". This Greek ped is used primarily in technical terms; such as pedagogics, which refers to the "science of teaching". There is more information about pedoagogue, pedagog on this page. Another derivative from the Greek ped is a word meaning "education" or the results of "education"; such as, "knowledge" or "learning". The Greek element pedia is found in other Greek words; such as, cyclopedia and encyclopedia, "circles of knowledge". A desire to give birth to or to bear a beautiful child: Kent and Sally were convinced that their desire to have a callipedia was achieved when their daughter was born. 1. The circle of learning; the whole body of arts and sciences. 2. A book containing extensive information about all branches of knowledge, or about all of the areas of some particular art, science, and specialized information; all of which are arranged alphabetically. Pertaining to or of the nature of a reference work; often in several volumes, containing articles about various topics that are often arranged in alphabetical order, dealing with the entire range of human knowledge or with some particular contents. 1. The circle of learning; a general course of instruction. 2. A literary work containing extensive information about all branches of knowledge which are normally arranged in alphabetical order. 3. An elaborate and exhaustive repertory of information on all the branches of some particular art or department of knowledge. 4. Etymology: from Greek egkukiopaideia, "general education"; from egkuklios, "general" + paideia, "education"; from pais, "boy, child"; however, literally "training in a circle" from enkyklios, "circular" + paideia, "education, child-rearing", from pais, "boy, child". The term encyclopedia is said to be an erroneous form (a false reading) occurring in manuscripts of Quintilian, Pliny, and Galen, for "encyclical education", the circle of arts and sciences considered by the Greeks as essential to a liberal education. A reference to a whole circle of learning that comprises a wide range of subjects. Pertaining to, or resembling an encyclopedia; that strives to present information about all branches of learning; and relating to universal knowledge and comprehensive. 1. A compiler of or a writer for an encyclopedia. 2. Someone who attempts to deal with every branch of knowledge, or whose studies have a very extensive range. The dances or other exercises performed by unclad boys at public festivals in ancient Greece: The gymnopaedia on festive occasions in Greece included boys who were not wearing any attire because it was a tradition in those days. 1. Instruction in a subject; such as, a foreign language, during sleep, usually with the use of recordings and a pillow-speaker: In other words, hypnopedia is "sleep-learning". 2. Etymology: from Greek hypnos, "sleep" + paideia "child". A company that supplies multimedia and interactive television services and digital arts software tools and information is presented in the form of extended articles. A system in which information is presented in condensed or shortened formats. 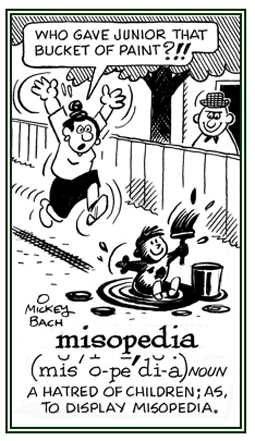 A morbid hatred of or an aversion to children; sometimes including one's own child: Kathy has a feeling of misopedia which was intensified when her neighbor's son accidentally hit a baseball through her living room window and he denied doing it even though she saw him do it while she was outside working in her garden. Obviously there are many examples of misopedias taking place in some societies, because every once in a while, there are news reports that reveal information about some adults being prosecuted for not taking care of their children or because they were mistreating them. 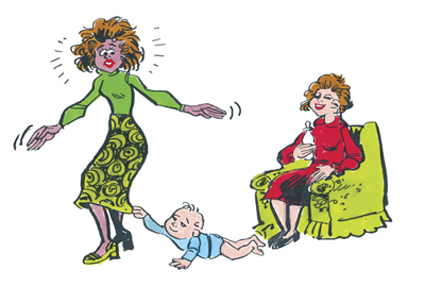 Someone who has a fear and strong dislike about being around children which may include his or her own child or children: Mary was a misopedist who sometimes went to visit her older sister who had a baby, but she tried to avoid letting the child touch her because she couldn't tolerate such contact. 1. Relating to or concerned with the cure of deformities in children, or of bodily deformities in general. 2. Orthopedic bed, a bed in an orthopedic ward; normally one individually designed to relieve specific skeletal symptoms; more generally, a bed with a very firm mattress or board. It also refers to orthopedic bedding, divan, etc. 3. An orthopedic shoe, a shoe designed to ease or to correct deformities of the feet; also, orthopedic boot, footwear. Showing page 1 out of 5 pages of 65 main-word entries or main-word-entry groups.